Rustic Basement Remodel Wins Regional & Local CotY Award - Remodeling Designs, Inc.
We are thrilled to announce that we were awarded the Region 4 East Central (OH, IN, KY & MI) Contractor of the Year Award for the category Basement Remodel $50,000-$100,000. Additionally, we received three local 2017 Miami Valley NARI Contractor of the Year Awards. We will be showcasing each one of our winning projects on our blog. 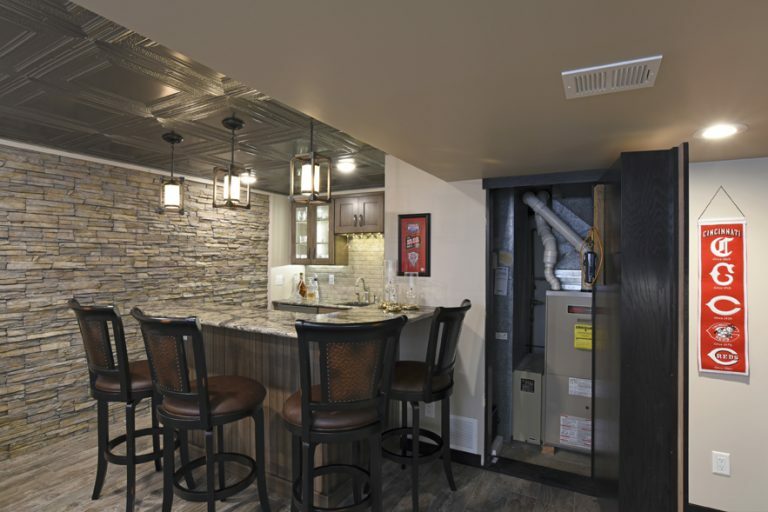 The first exciting award winner is our Regional & Miami Valley CotY Award for a Basement Remodel $50,000-$100,000. It’s amazing what can happen after a trip to Napa! This couple came home with a couple hundred bottles of wine that they enjoyed on their vacation, and suddenly there was a desire for a room to show them off! 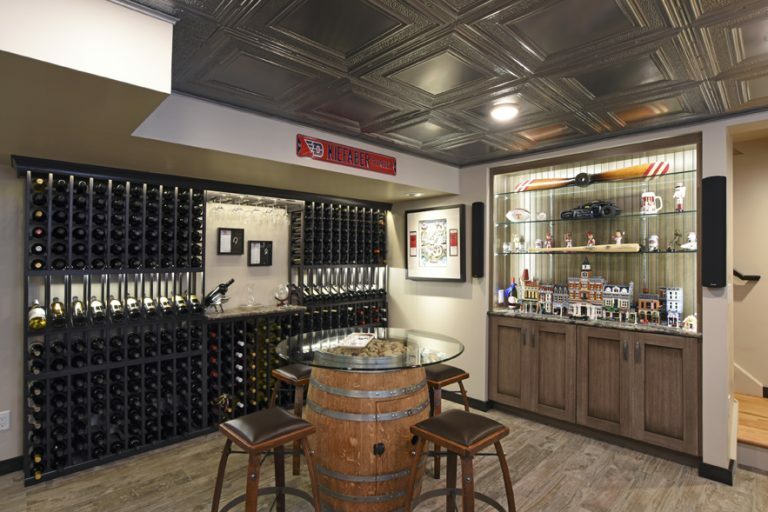 Originally, they only wanted wine storage, but the project grew to include a nice bar area to sit and enjoy the wine. Finally, it transformed into a space where sipping wine was an entire experience! 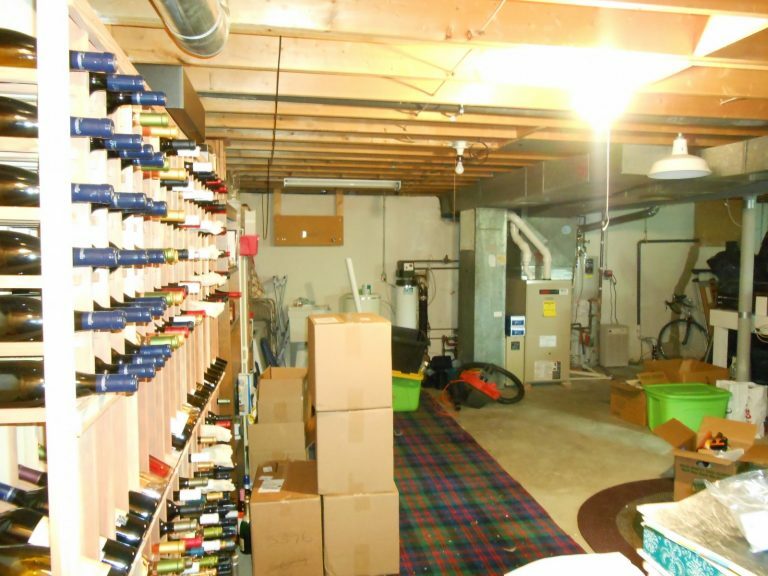 This was an unfinished basement with shelves of totes and boxes that are typically stored in an unfinished storage area. 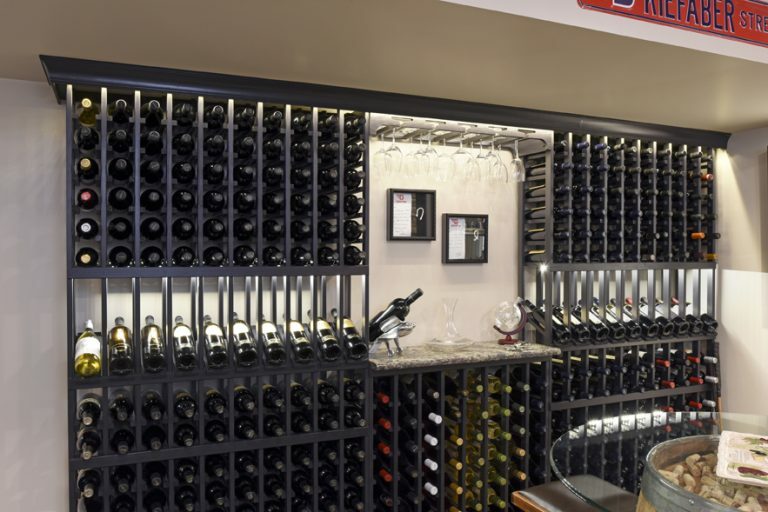 As the wine began to arrive, it was placed on dedicated wine racks that were unfinished and placed along a concrete wall as you first enter from the stairs. Once you step down into this new room, it feels as though you are walking into an old tavern with old looking flooring, stone wall and tin ceiling. The mixture of textures in this room creates a cozy feeling you can certainly relax in with a nice glass of wine. Working in an unfinished basement always has its challenges. 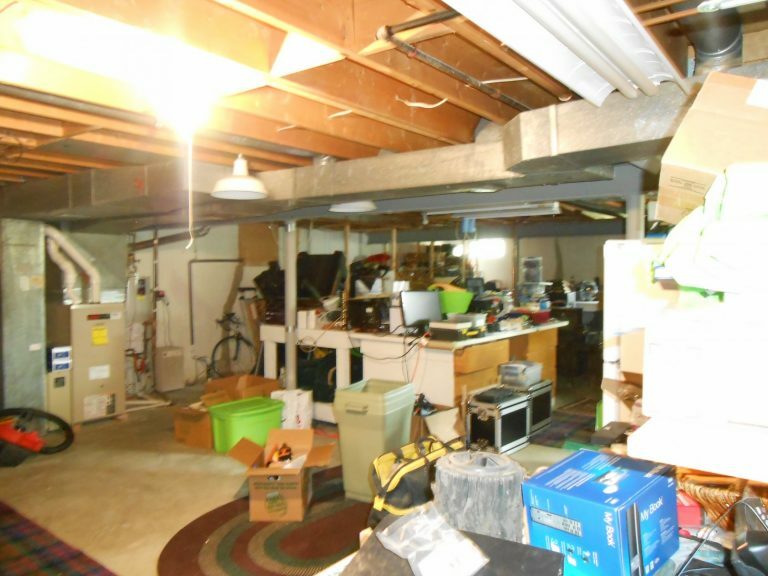 We had the HVAC to conceal and the normal beams and posts to work around. The question was, just how close can we get to the furnace to allow as large of a bar as possible? We literally wrapped a wall in front of the HVAC and kept the bar at this same end of the room so existing plumbing and drain lines could be utilized. 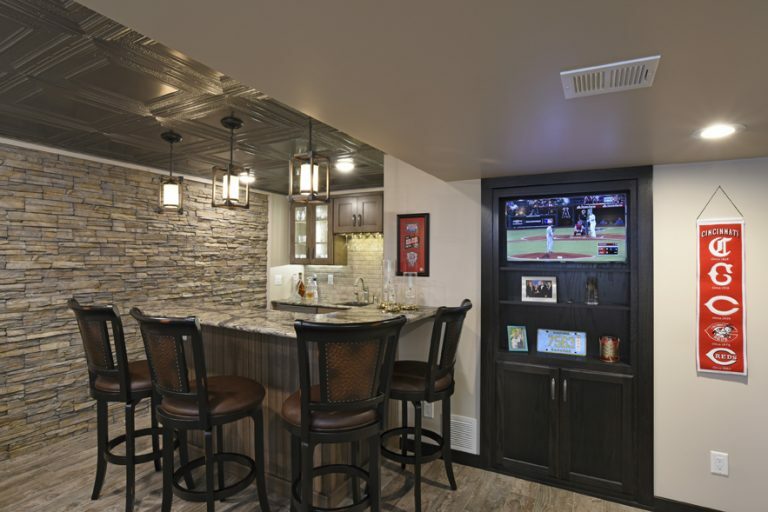 The finished bar tucked nicely between the new stone wall and the concealed HVAC. We also incorporated a beverage cooler for other drinks and snacks that need to be refrigerated. The drawer base on the right end is actually a dishwasher drawer so no one has to drag glasses up and down the stairs for washing. 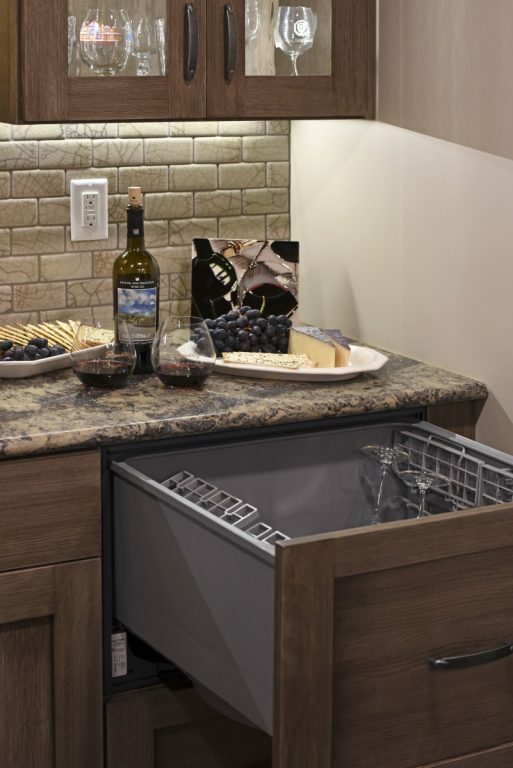 This makes entertaining a breeze and clean up even easier because everything can stay on this level. 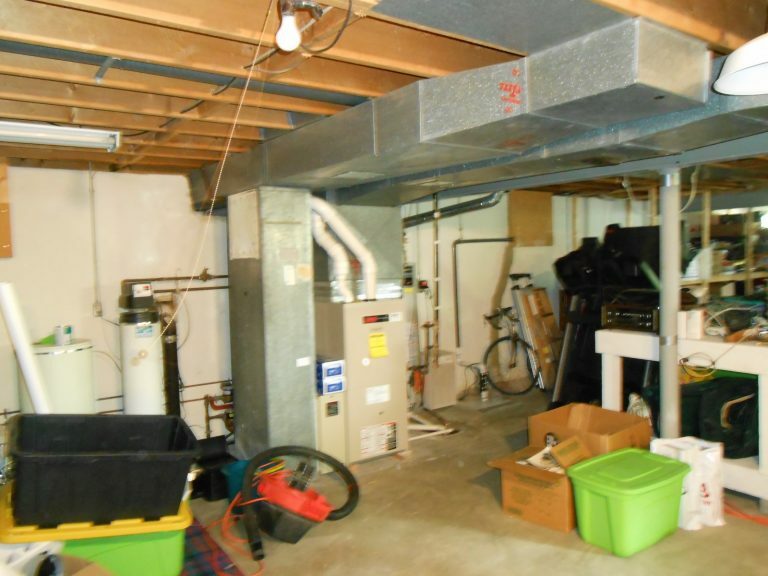 One of the biggest challenges was to figure out how to access the filter from the furnace while still concealing it every day. The last thing we wanted was any problem replacing the furnace if the need arose down the road. Accessing the furnace just from the unfinished area simply wasn’t enough room on the side to change the filter. The bookcase pulls out as a secret door to reveal the exact area anyone would need to service the furnace and change the filter. With this door, there are two access points to the furnace and other mechanicals of the home. The plan all along was to maintain some unfinished area in the basement for a workbench and open shelving for totes and boxes. We had to drop the ceiling to cover the ventilation lines and just beyond that was the main structural beam which created the perfect stopping point to our new room. A finished door which coordinated with the room was installed to access the unfinished area of the basement. We kept their new wine racks but painted them black to blend nicely with the new décor. 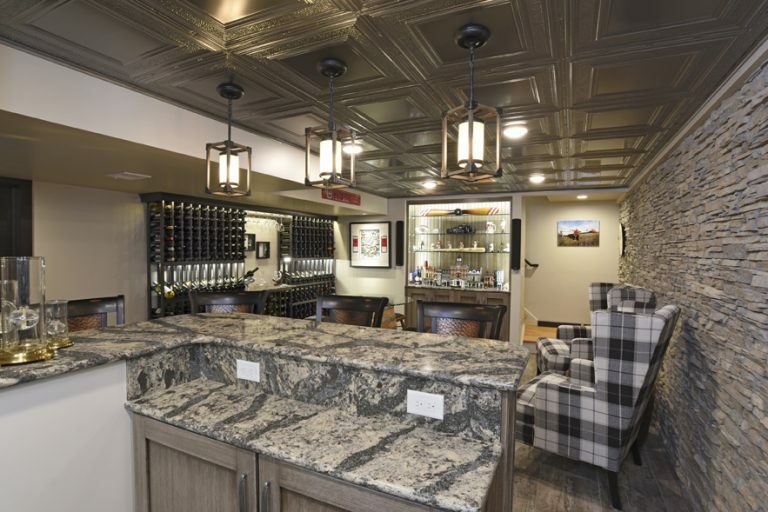 We installed their existing wine racks and added a small tasting area with the same countertop as the main bar area. LED tape lighting was used to light up the bottles and feature a tasting area. 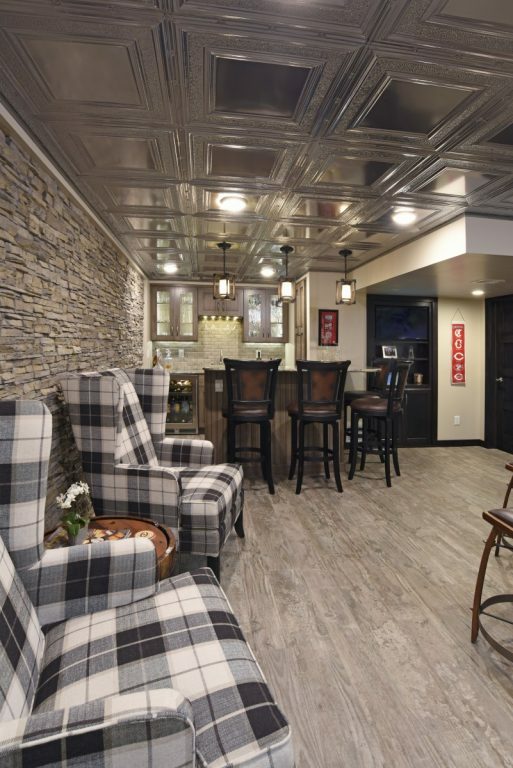 After framing in the HVAC, we opted to feature the raised ceiling portion to really add personality and character to this space by adding a tin ceiling detail. We were able to recess a few can lights perfectly within the squares of the tin ceiling without throwing off the symmetry of the overall look. The view from behind the bar says it all. It’s a wonderful space to entertain friends and family and to enjoy a rare glass of wine! 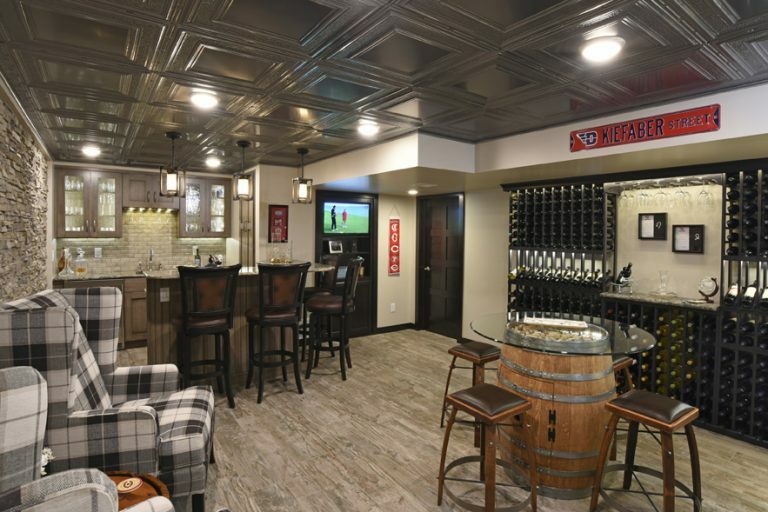 Since we won the regional award, our basement remodel project is automatically entered into the National category where it will compete against the other 6 region winners. Make sure to check back after April 7th to see if we bring home a National Contractor of the Year Award. 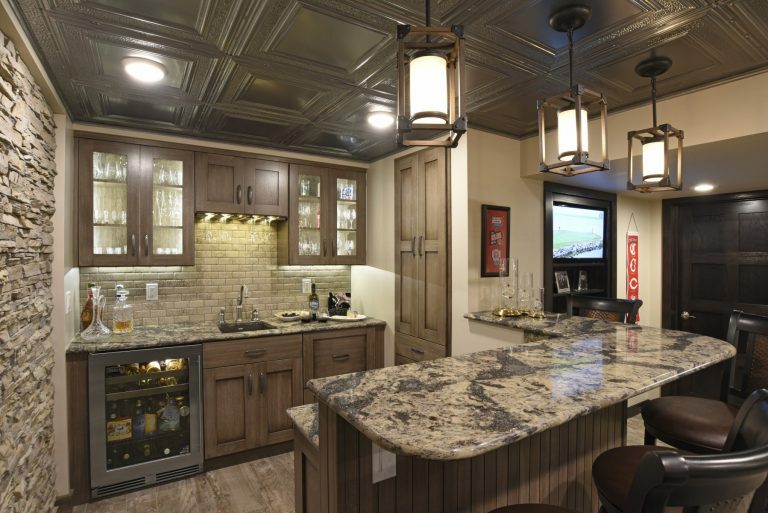 This entry was posted in Home Remodeling, Lower Level, Remodeling Designs, Inc. and tagged bar, basement remodel, cambria countertop, coty award, lower level remodel, nari, rustic basement, stone wall, tin ceiling, wine room, wine storage, wood tile. Bookmark the permalink.